Your baby is the light of your life – every time you look at your child, you can’t help but beam. You want to give your little one every possible advantage in life so that your child can smile just as brightly as you do. To make this a possibility, it’s important to consider the impact that baby bottles can have on children’s teeth and developing jaw structure. In this post, the team at Treasured Teeth, your respected pediatric dentist in Reunion, CO, explains how extended bottle feeding can negatively affect your child’s smile – and what you can do about it. Why Is Extended Bottle Feeding A Concern? While bottles offer the same advantages as pacifiers for young babies, too much of a good thing can cause problems. Bottles can cause a condition commonly referred to as pacifier teeth, which changes the way your child’s entire smile fits together – so be sure to toss the bottle no later than 14 months. How Can Bottle Feeding Lead To Tooth Decay? #1 – Since kids take their time with liquids that are given to them in bottles, this prolongs the exposure they have with substances that increase oral bacteria and cause tooth decay and prevents saliva from naturally remineralizing teeth. #2 – Many parents use sweet beverages like fruit juice in bottles which essentially bathe your child’s teeth in sugar with every sip. Never let your baby go to sleep with a bottle filled with anything other than water – even formula and breast milk have sugars that will lead to enamel problems and cavities. 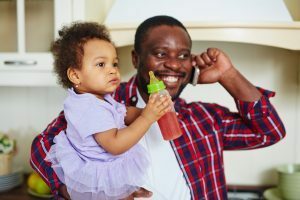 How Can I Help My Child Stop Using A Bottle? Start weaning as soon as your child turns 6 months old – giving enough time for the process is essential. If you breastfeed exclusively for 9-12 months, skip introducing the bottle altogether to avoid the issue. Give your baby a chance to drink from a sippy cup while in the bathtub to make cleanup easier. Decrease the number of bottles you provide – one at a time – and substitute snacks and drinks in a cup instead. Water down milk and drinks in bottles, but give undiluted drinks that taste better in cups. Let your child pick out a special cup or silly straw to make cups fun and enjoyable. If you need more tips on how to help wean your child off the bottle, or if your child is a year old and hasn’t had their first dental appointment yet, schedule a visit with the team at Treasured Teeth – we’ll set your child up for a lifetime of smile success!